The Carolingian Renaissance occurred mostly during the reigns of Carolingian rulers Charlemagne and Louis the Pious. It was supported by the scholars of the Carolingian court, notably Alcuin of York. Charlemagne's Admonitio generalis (789) and Epistola de litteris colendis served as manifestos. The effects of this cultural revival were mostly limited to a small group of court literati. According to John Contreni, "it had a spectacular effect on education and culture in Francia, a debatable effect on artistic endeavors, and an unmeasurable effect on what mattered most to the Carolingians, the moral regeneration of society". The secular and ecclesiastical leaders of the Carolingian Renaissance made efforts to write better Latin, to copy and preserve patristic and classical texts, and to develop a more legible, classicizing script. (This was the Carolingian minuscule that Renaissance humanists took to be Roman and employed as humanist minuscule, from which has developed early modern Italic script.) They also applied rational ideas to social issues for the first time in centuries, providing a common language and writing style that enabled communication throughout most of Europe. As Pierre Riché points out, the expression "Carolingian Renaissance" does not imply that Western Europe was barbaric or obscurantist before the Carolingian era. The centuries following the collapse of the Roman Empire in the West did not see an abrupt disappearance of the ancient schools, from which emerged Martianus Capella, Cassiodorus and Boethius, essential icons of the Roman cultural heritage in the Middle Ages, thanks to which the disciplines of liberal arts were preserved. The 7th century saw the "Isidorian Renaissance" in the Visigothic Kingdom of Hispania in which sciences flourished and the integration of Christian and pre-Christian thought occurred, while the spread of Irish monastic schools (scriptoria) over Europe laid the groundwork for the Carolingian Renaissance. There were numerous factors in this cultural expansion, the most obvious of which was that Charlemagne's uniting of most of Western Europe brought about peace and stability, which set the stage for prosperity. This period marked an economic revival in Western Europe, following the collapse of the Western Roman Empire. Local economies in the West had degenerated into largely subsistence agriculture by the early seventh century, with towns functioning merely as places of gift-exchange for the elite. By the late seventh century, developed urban settlements had emerged, populated mostly by craftsmen, merchants and boaters and boasting street grids, artisanal production as well as regional and long-distance trade. A prime example of this type of emporium was Dorestad. The development of the Carolingian economy was fueled by the efficient organization and exploitation of labor on large estates, producing a surplus of primarily grain, wine and salt. In turn, inter-regional trade in these commodities facilitated the expansion of towns. Archaeological data shows the continuation of this upward trend in the early eighth century. The zenith of the early Carolingian economy was reached from 775 to 830, coinciding with the largest surpluses of the period, large-scale building of churches as well as overpopulation and three famines that showed the limits of the system. After a period of disruption from 830 to 850, caused by civil wars and Viking raids, economic development resumed in the 850s, with the emporiums disappearing completely and being replaced by fortified commercial towns. One of the major causes of the sudden economic growth was the slave trade. Following the rise of the Arab empires, the Arab elites created a major demand for slaves with European slaves particularly prized. As a result of Charlemagne's wars of conquest in Eastern Europe, a steady supply of captured Slavs, Avars, Saxons and Danes reached mostly Jewish merchants in Western Europe, who then exported the slaves via Ampurias, Girona and the Pyrenees passes to Muslim Spain and other parts of the Arab world. The market for slaves was so lucrative that it almost immediately transformed the long-distance trade of the European economies. The slave trade enabled the West to re-engage with the Muslim and Eastern Roman empires so that other industries, such as textiles, were able to grow in Europe as well. Charlemagne was able to offer the cultureless and, I might say, almost completely unenlightened territory of the realm which God had entrusted to him, a new enthusiasm for all human knowledge. In its earlier state of barbarousness, his kingdom had been hardly touched at all by any such zeal, but now it opened its eyes to God's illumination. In our own time the thirst for knowledge is disappearing again: the light of wisdom is less and less sought after and is now becoming rare again in most men's minds. A lack of Latin literacy in eighth century western Europe caused problems for the Carolingian rulers by severely limiting the number of people capable of serving as court scribes in societies where Latin was valued. Of even greater concern to some rulers was the fact that not all parish priests possessed the skill to read the Vulgate Bible. An additional problem was that the vulgar Latin of the later Western Roman Empire had begun to diverge into the regional dialects, the precursors to today's Romance languages, that were becoming mutually unintelligible and preventing scholars from one part of Europe being able to communicate with persons from another part of Europe. To address these problems, Charlemagne ordered the creation of schools in a capitulary known as the Charter of Modern Thought, issued in 787. A major part of his program of reform was to attract many of the leading scholars of the Christendom of his day to his court. Among the first called to court were Italians: Peter of Pisa, who from 776 to about 790 instructed Charlemagne in Latin, and from 776 to 787 Paulinus of Aquileia, whom Charlemagne nominated as patriarch of Aquileia in 787. The Lombard Paul the Deacon was brought to court in 782 and remained until 787, when Charles nominated him abbot of Montecassino. Theodulf of Orléans was a Spanish Goth who served at court from 782 to 797 when nominated as bishop of Orléans. 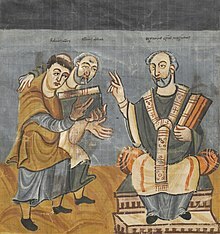 Theodulf had been in friendly competition over the standardization of the Vulgate with the chief among the Charlemagne's scholars, Alcuin of York. Alcuin was a Northumbrian monk and deacon who served as head of the Palace School from 782 to 796, except for the years 790 to 793 when he returned to England. After 796, he continued his scholarly work as abbot of St. Martin's Monastery in Tours. Among those to follow Alcuin across the Channel to the Frankish court was Joseph Scottus, an Irishman who left some original biblical commentary and acrostic experiments. After this first generation of non-Frankish scholars, their Frankish pupils, such as Angilbert, would make their own mark. The later courts of Louis the Pious and Charles the Bald had similar groups of scholars. The Irish monk Dicuil attended the former court, and the more famous Irishman John Scotus Eriugena attended the latter. One of the primary efforts was the creation of a standardized curriculum for use at the recently created schools. Alcuin led this effort and was responsible for the writing of textbooks, creation of word lists, and establishing the trivium and quadrivium as the basis for education. 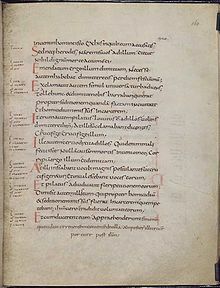 Another contribution from this period was the development of Carolingian minuscule, a "book-hand" first used at the monasteries of Corbie and Tours that introduced the use of lower case letters. A standardized version of Latin was also developed that allowed for the coining of new words while retaining the grammatical rules of Classical Latin. This Medieval Latin became a common language of scholarship and allowed administrators and travelers to make themselves understood in various regions of Europe. Carolingian workshops produced over 100,000 manuscripts in the 9th century, of which some 7,000 or 6% survive. The Carolingians produced the earliest surviving copies of the works of Cicero, Horace, Martial, Statius, Lucretius, Terence, Julius Caesar, Boethius and Martianus Capella. No copies of the texts of these authors were made in the Latin West in the 7th and 8th centuries. Carolingian art spans the roughly hundred-year period from about 800–900. Although brief, it was an influential period. Northern Europe embraced classical Mediterranean Roman art forms for the first time, setting the stage for the rise of Romanesque art and eventually Gothic art in the West. Illuminated manuscripts, metalwork, small-scale sculpture, mosaics, and frescos survive from the period. A musician playing a cithara that is thought to have evolved from the Greek lyre, from the 9th century Charles the Bald Bible. Player with cithara that appears lute-like, from the 9th century Utrecht Psalter. A cithara (word used by the early 9th century Stuttgart Psalter) being held as a citole would three centuries later. Documents created during the Carolingian Renaissance show growth of instrumental music with new instruments. The images may document earlier European cythara (lute types) or else a "revival of the Roman kithara." 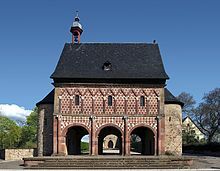 Carolingian architecture is the style of North European architecture promoted by Charlemagne. The period of architecture spans the late eighth and ninth centuries until the reign of Otto I in 936, and was a conscious attempt to create a Roman Renaissance, emulating Roman, Early Christian and Byzantine architecture, with its own innovation, resulting in having a unique character. Its architecture was the most salient Carolingian art to a society that never saw an illuminated manuscript and rarely handled one of the new coins. "The little more than eight decades between 768 to 855 alone saw the construction of 27 new cathedrals, 417 monasteries, and 100 royal residences", John Contreni calculates. Around AD 755, Charlemagne's father Pepin the Short reformed France's currency. A variety of local systems was standardized, with minor mints being closed, royal control over the rest strengthened, and purity increased. In place of the gold Roman and Byzantine solidus then common, he established a system based on a new .940-fine silver penny (Latin: denarius; French: denier) weighing 1/240 of a pound (librum, libra, or lira; livre). (The Carolingian pound seems to have been about 489.5 grams, making each penny about 2 grams.) As the debased solidus was then roughly equivalent to 11 of these pennies, the shilling (solidus; sol) was established at that value, making it 1/22 of the silver pound. This was later adjusted to 12 and 1/20, respectively. During the Carolingian period, however, neither shillings or pounds were minted, being instead used as notional units of account. (For instance, a "shilling" or "solidus" of grain was a measure equivalent to the amount of grain that 12 pennies could purchase.) Despite the purity and quality of the new pennies, however, they were repeatedly rejected by traders throughout the Carolingian period in favor of the gold coins used elsewhere, a situation that led to repeated legislation against such refusal to accept the king's currency. The Carolingian system was imported to England by Offa of Mercia and other kings, where it formed the basis of English currency until the late 20th century. Aachen Gospels (c. 820), an example of Carolingian illumination. ^ Einhard's use of the Roman historian Suetonius as a model for the new genre of biography is itself a marker for the Carolingian Renaissance. ^ Contreni (1984), p. 59. ^ Fernández-Morera, Darío (2016). The Myth of the Andalusian Paradise. Muslims, Christians and Jews under Islamic Rule in Medieval Spain. ISI Books. p. 70. ISBN 9781504034692. ^ Fear, A. T. (1997). Lives of the Visigothic Fathers. Liverpool University. p. XXII-XXIII. ISBN 978-0853235828. ^ Kampers, Gerd (2008). Geschichte der Westgoten. Ferdinand Schöningh. p. 322. ISBN 9783506765178. ^ Louis Halphen, Les Barbares, Paris, 1936, p. 236 ; Étienne Gilson, La Philosophie au Moyen Âge, Paris, 1944, p. 181. ^ a b c d Verhulst 2002, p. 133. ^ a b Verhulst 2002, p. 113. ^ a b Verhulst 2002, p. 135. ^ a b Verhulst 2002, p. 134. ^ Verhulst 2002, p. 105. ^ Frost, Peter (September 14, 2013). "From Slavs to Slaves". Evo and Proud. ^ Goody, Jack (2012). The Theft of History. Cambridge University Press. pp. 87–88. ISBN 9781107394704. ^ a b Scott (1964), p. 30. ^ Cantor (1993), p. 190. ^ Lewis Thorpe, tr., Einhard and Notker the Stammerer, Two Lives of Charlemagne, 1969:49f. ^ Carolingian Schools, Carolingian Schools of Thought. ^ Cantor (1993), p. 189. ^ Chambers & al. (1983), pp. 204-205. ^ Buringh 2010, p. 237. ^ a b Buringh 2010, p. 139. ^ Winternitz, Emanuel (July–December 1961). "THE SURVIVAL OF THE KITHARA AND THE EVOLUTION OF THE CITTERN, A Study in Morphology". Journal of the Warburg and Courtauld Institutes. 24 (3/4): 213. Retrieved 24 November 2016. ^ Contreni (1984), p. 63. ^ a b Allen (2009). ^ a b c d Chown (1994), p. 23. ^ Munro (2012), p. 31. ^ a b Suchodolski (1983). ^ Scott (1964), p. 40. Allen, Larry (2009), "Carolingian Reform", The Encyclopedia of Money, Sta. Barbara: ABC Clio, pp. 59–60, ISBN 978-1-59884-251-7 . Buringh, Eltjo (2010). Medieval Manuscript Production in the Latin West. Brill Publishers. ISBN 978-9004175198. Cantor, Norman F. (1993). The Civilization of the Middle Ages: a completely revised and expanded edition of Medieval history, the life and death of a civilization. HarperCollins. ISBN 978-0-06-017033-2. Chambers, Mortimer; et al. (1983), The Western Experience to 1715 (3rd ed. ), New York: Alfred A. Knopf, ISBN 978-0-394-33085-3 . Chown, John F (1994), A History of Money from AD 800, London: Routledge, ISBN 978-0-415-10279-7 . Contreni, John G. (1984), "The Carolingian Renaissance", Renaissances before the Renaissance: cultural revivals of late antiquity and the Middle Ages . Ferguson, Wallace K. (1974), "Money and Coinage of the Age of Erasmus: An Historical and Analytical Glossary with Particular Reference to France, the Low Countries, England, the Rhineland, and Italy", The Correspondence of Erasmus: Letters 1 to 141: 1484 to 1500, Toronto: University of Toronto Press, pp. 311–349, ISBN 978-0-8020-1981-3 . Grier, James (Spring 2003), "Ademar de Chabannes, Carolingian Musical Practices, and "Nota Romana", Journal of the American Musicological Society, 56 (1), [University of California Press, American Musicological Society], pp. 43–98, doi:10.1525/jams.2003.56.1.43, JSTOR 10.1525/jams.2003.56.1.43 . Innes, M. (1997), "The classical tradition in the Carolingian Renaissance: Ninth-century encounters with Suetonius", International Journal of the Classical Tradition . Munro, John H. (2012), "The Technology and Economics of Coinage Debasements in Medieval and Early Modern Europe: With Special Reference to the Low Countries and England", Money in the Pre-Industrial World: Bullion, Debasements, and Coin Substitutes, Pickering & Chatto, republished 2016 by Routledge, pp. 30 ff, ISBN 978-1-84893-230-2 . Nelson, Janet L. (1986), "On the limits of the Carolingian renaissance", Politics and Ritual in Early Medieval Europe . Scott, Martin (1964), Medieval Europe, New York: Dorset Press, ISBN 978-0-88029-115-6 . Suchodolski, Stanislaw (1983), "On the Rejection of Good Coin in Carolingian Europe", Studies in Numismatic Method: Presented to Philip Grierson, Cambridge: Cambridge University Press, pp. 147–152, ISBN 978-0-521-22503-8 . Thorndike, Lynn (1943), "Renaissance or Prenaissance? ", Journal of the History of Ideas, No. 4, pp. 65 ff . Trompf, G.W. (1973), "The concept of the Carolingian Renaissance", Journal of the History of Ideas, pp. 3 ff . Verhulst, Adriaan (2002). The Carolingian Economy. Cambridge University Press. ISBN 978-0-521-00474-9. This page was last edited on 6 March 2019, at 20:00 (UTC).